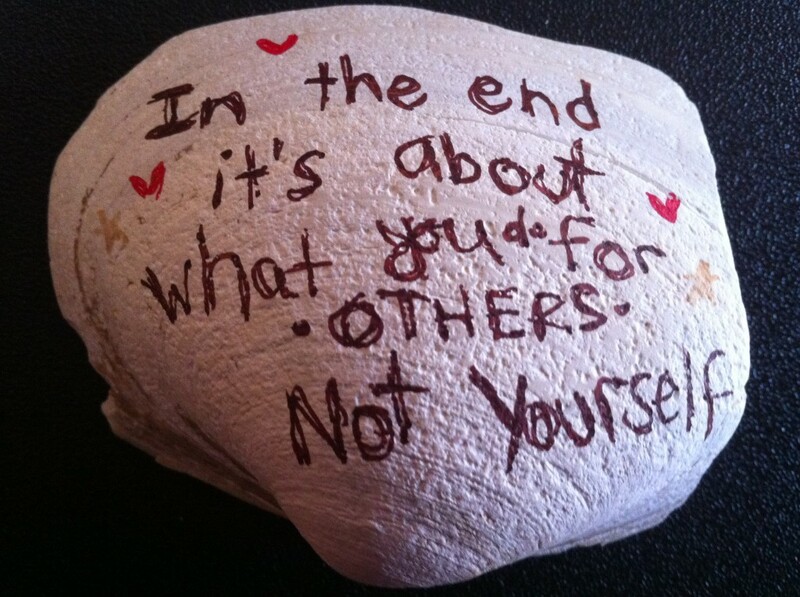 In the end, it’s about what you do for others, not yourself. Home / Adviart Blog / In the end, it’s about what you do for others, not yourself. In the end, it’s about what you do for others, not yourself. This shell was picked by the adviarter when it had two pieces to it…one side of the shell fully in tact and one half broken and barely hanging on. The words are a statement of life–of the pursuit of giving to others in need. The adviart coming from the perspective that Mother Teresa had–judgement will be on how we utilize our lives to help others. The adviarter picked natural colors and used a blending of words and small hearts throughout the design. I noticed that OTHERS is in capital letters–catching my eye and stressing the focus outside of self. The adviart opened up a great discussion on the definition of words–particularly the word selfishness. The question circles around how we can help others–at what point do we help them, when we see they could use help or when they ask for it? How can we consistently incorporate a focus on others into our daily lives? Is it possible to do this in a variety of ways? Do what you love, and the rest will fall into place.